Friday Night: Mostly clear to partly cloudy with lows into the upper 60s. Saturday: Increasing clouds through the day. Showers/storms late. Highs in the upper 80s. Sunday: Refreshing with a few lingering showers/storms in the morning, with spotty PM showers. Highs in the lower 70s. If you are a fan of the heat you will get one more day in the 90s. 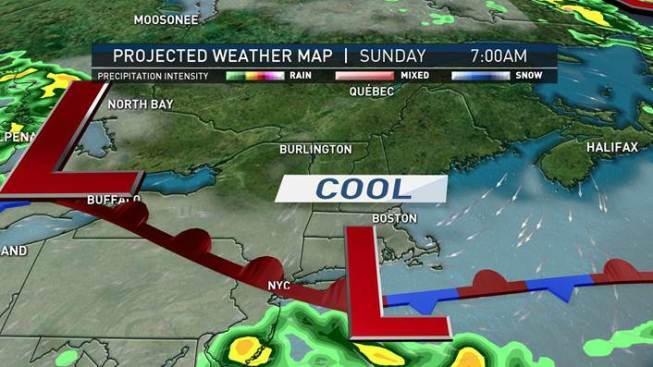 The cold front is behind schedule. It won't move through until tonight. Saturday night and into Sunday clouds will increase. Parts of southern New England will see a few showers. Sunday morning clouds will clear out and the weather will turn pretty nice. It will be much cooler with high temperatures in the low to mid 70s. A period of steady rain is likely on Monday. High temperatures will struggle to get out of the 60s. Showers clear out Tuesday morning, but it stays cool with temperatures in the low to mid 70s. Wednesday looks to be dry with highs in the mid to upper 70s. Unsettled weather returns Thursday afternoon through Saturday. Temperatures warm from the upper 70s into the lower 80s. At this point the second half of the following weekend looks nicer with sunny skies.